The Branch of the Future? I have a bank branch in my pocket. It’s open 24/7, wherever I happen to be. With it, I can conduct just about any banking transaction I want. The exception is withdrawing cash, and I can do that at almost any ATM I encounter anywhere in the world. Surveys say that many American bank customers still want to have a bank branch nearby, just in case they have a problem. But this reflects the low expectation consumers have of their banks and the sorry state of online customer service, not an innate desire for one-on-one interactions with a teller. Some say that bank branches are necessary for new account acquisition. But I’ll posit that much of this reflects misattribution. Many who would prefer to open an account online go to a branch only because the online account opening process is so woefully inadequate at most banks. Several banks have piloted a “branch of the future,” offering sleek design and a larger footprint, taking tellers out from behind the glass windows, and emphasizing cool technology. Some of these build off the ING Direct coffee shop concept; others imitate Apple’s retail stores. I’ve visited concept branches created by BNP Paribas in Paris, by Barclays in Piccadilly Circus, and by Deutsche Bank in Berlin. Each looked neat, but didn’t solve a customer need in a new way or, I’ll wager, justify the investment. They betray a limited conception of what a branch can be. As Ron Shevlin, Director of Research at Cornerstone Advisors and author of Smarter Bank, notes, “Bank branches aren’t vital.” So what should banks do? Has the branch of the future been designed by a mutual insurance company? Society of Grownups, an interesting experiment from MassMutual Life Insurance Company, suggests one possible direction. There is currently a single location, in Brookline, Massachusetts. MassMutual worked with IDEO in designing the program and the space-designed space. 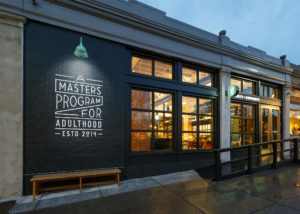 Targeting Millennials, Society of Grownups bills itself as a master’s program for adulthood. It’s a place where young adults can go learn about managing money, something it is very easy to graduate from college without knowing how to do. Importantly, they can do so while meeting similarly-responsible people. Millennials are an extremely important demographic for financial services. As a group, they face high levels of student debt and inflated housing prices, but perhaps their greatest challenge is a lack of financial knowledge and access to trusted sources of advice. But a three-year study by Scratch/Viacom Media Networks, referenced in this First Data white paper, shows that Millennials have very little interest in branches and very little loyalty to banks. Society of Grownups offers seminars and meetings with financial planners, classes about money, guest speakers, and financially-themed dinners. Hours are short even by bankers’ standards, but convenient for people who work. They are open from 4:00 p.m. to 9:00 p.m. Tuesday – Thursday and by appointment on Saturday. Society of Grownups is registered as an investment advisor with the SEC and does not currently receive any commissions or other compensation from companies for recommending products, nor do they appear to favor products from MassMutual. All Society of Grownups financial planners are salaried employees. In addition to in-person and online opportunities for learning, the Society is hoping to form partnerships with corporations and colleges and universities via @work and @school offerings. MassMutual likes the results thus far enough to have announced it will invest $100 million in the initiative. It does not appear that Society of Grownups is set up to seek venture capital. It is a subsidiary of MassMutual and it is set up as an LLC. MassMutual also appears to own 100% of the equity. One thing that’s surprising for a company with access to $100 million is the slow pace of expansion, with reports indicating just two more storefronts (in Philadelphia and New York City) planned in 2016 and an additional seven over the next three years. I’m intrigued by Society of Grownups. Is this the future of branches? This entry was posted in Banking, Innovation and tagged branches, MassMutual, Society of Grownups by jim. Bookmark the permalink.